Since I’ve started Springheel’s super duper workshop, I could not help myself and decided to jump into DR immediately. I started with the A-Z guide and bounced around the wiki and Google for help. What follows are some small issues I’ve had. The angle readout in Rotate mode isn't customisable. Font size? Colour? I cannot find any docs on what Select inside, Select touching and Select complete tall do. Select touching does what I initially thought, the other two just delete the selected brush(es). Confusing. 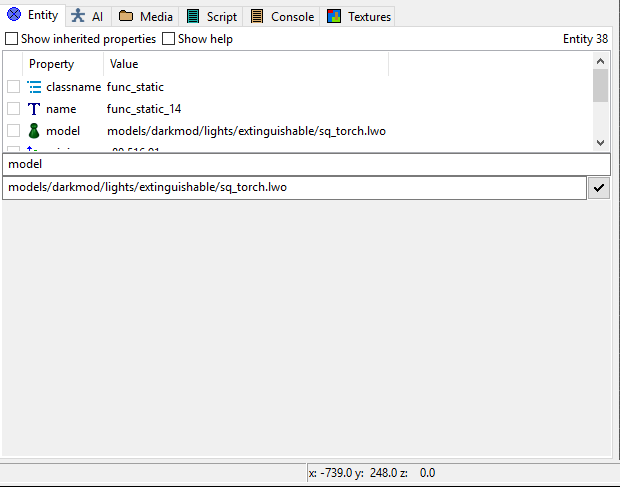 I cannot expand the list of properties in the Entity Inspector, makes seeing what I can edit annoying since I only see three lines at a time (pic). Is there a way to only select what is fully inside the selection box when I drag select? That's what "select inside" does. You draw a brush, and click that button to select everything inside the brush. You can, just click the horizontal line between the model path and the gray area, then drag it down.